I n July 2016, we launched our Viral Service and began delivering ready-to-use lentivirus and adeno-associated virus (AAV) to scientists around the world. We began with only a few inventory items offered domestically, but by the end of 2016, we expanded our viral inventory to 25 lentiviruses and 25 AAVs. These viruses have been distributed in over 200 packages to more than 20 countries. With this initial success, we will continue to provide and expand this diverse and useful collection of tools so that researchers around the world can accelerate their work. After all, as we like to sayat Addgene, productivity is infectious. Curious which viruses researchers have found the most useful so far? 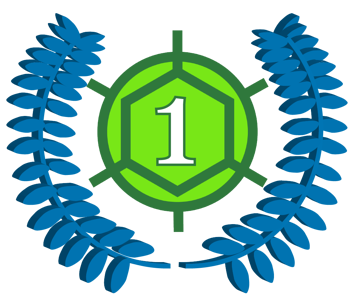 We crunched the numbers on our Viral Service (and then we crunched them again) to find the most requested lentivirus and AAV of 2016. Most of Addgene’s lentiviral inventory is based on CRISPR tools, though we do provide a few non-CRISPR related viral preps. Cas9 is the headliner of most CRISPR applications and can be expressed from your cell line of choice after transduction with this virus. While various Cas9 mutants have been engineered to perform unique editing tasks, classic Cas9 nuclease, which introduces double stranded DNA breaks, can be expressed from lentiCas9-Blast. LentiCas9-blast is a Cas9 expression vector developed by Feng Zhang’s lab at the Broad Institute (Sanjana et al., 2014). It is a dual-vector system, meaning it is typically used in conjunction with a second vector that delivers gRNA, such as lentiGuide-Puro. 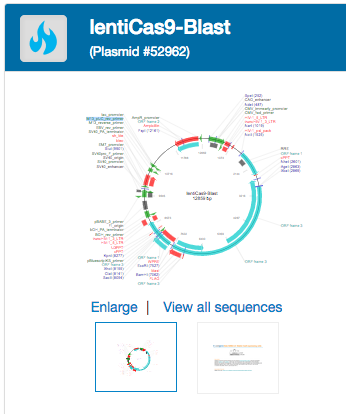 The alternative single-vector systems typically express Cas9 and a gRNA from the same plasmid. 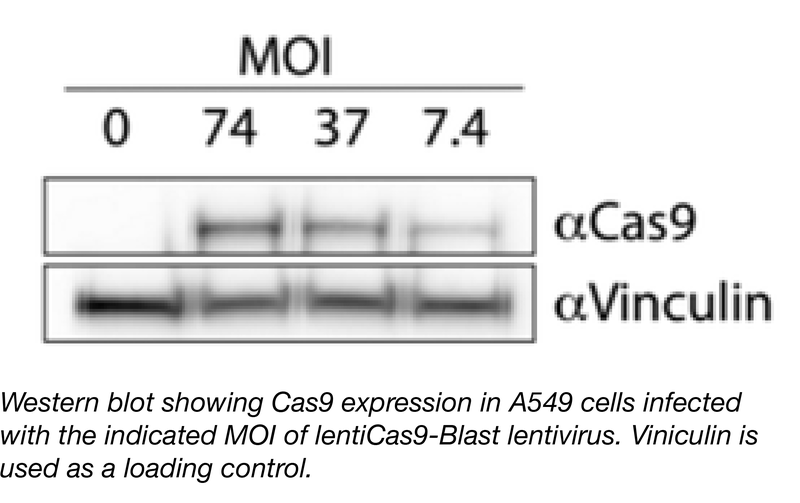 LentiCas9-blast virus can be used to generate Cas9-expressing cell lines, which can then be used both for screens (using pooled CRISPR knockout libraries) and individual gene knockouts (using gRNA lentiviruses). Separating Cas9 and the gRNA into two constructs (i.e., using a dual-vector system as opposed to a single-vector system) has several benefits. First, the low viral titers typically associated with Cas9-expressing lentiviruses will no longer be carried over to the gRNA lentiviruses. This means that if you received lentiCas9-blast lentivirus from Addgene, you could use it in conjunction with gRNA lentiviruses easily made in your own lab. We provide protocols and useful tips for generating your own lentivirus. Secondly, you can use a LentiCas9-Blast viral prep to create a single stable Cas9-expressing cell line and then transduce this line with lentiviruses expressing various gRNAs. It’s better to compare the phenotypic effects of expressing various gRNAs in a monoclonal Cas9 background because you’ll have more consistent levels of Cas9 expression between experiments and over time (as compared to separate transductions with a single-vector system). Cas9 expression is typically cytotoxic, which makes generation of high titer Cas9 lentiviruses challenging. This cytotoxicity also causes growth rate variability when using lentiCas9-blast to generate Cas9-expressing cells. To ensure that this growth rate effect doesn’t confound your experimental data, we recommend generating a monoclonal Cas9-expression line prior to performing a screen or even a single gene knockout. Our current AAV inventory consists almost entirely of viruses expressing DREADDs from Bryan Roth’s lab at the University of North Carolina, Chapel Hill. These can be used to investigate the effects of activating particular signaling pathways in specific cell types (typically neurons). While all of these viruses are popular, pAAV-hSyn-DIO-hM4D(Gi)-mCherry contains a double floxed human muscarinic receptor 4 (Gαi-coupled) DREADD fused to mCherry, all under the control of the human synapsin promoter. pAAV-hSyn-DIO-hM4D(Gi)-mCherry can be used to induce neuronal silencing in vitro and in vivo (Krashes et al., 2011). The various serotypes available (AAV2, AAV5, AAV8) enable different patterns of transduction and transgene expression across different cell types (Aschauer et al., 2013). 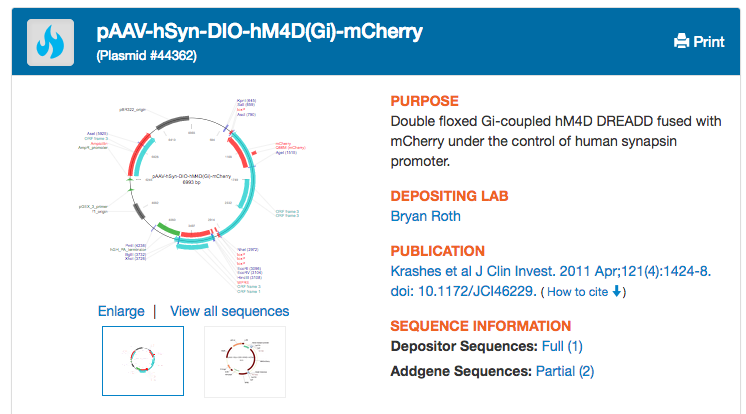 Expression of hM4D(Gi)-mCherry from this virus is cre-dependent, meaning that once injected, the DREADD will only be expressed in cells that express cre recombinase. Typically, this feature is used to attain cell-specific expression in transgenic animals, where cre expression is restricted to a particular cell type. 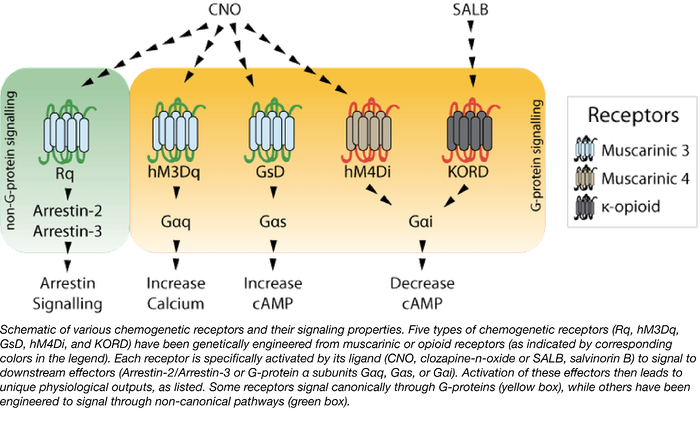 The human synapsin promoter further specifies neuron-specific expression of the DREADD (Kügler et al., 2003), which can then be exclusively activated by the small molecule clozapine N-oxide (CNO) (Krashes et al., 2011). Viruses expressing pAAV-hSyn-DIO-hM4D(Gi)-mCherry are typically injected into brain regions of mice, rats, or non-human primates. To activate the DREADD, CNO is delivered either through drinking water or intravenously. When using this virus for the first time, the Roth Lab recommends verifying cre expression prior to use. The lab additionally recommends using an anti-mCherry antibody rather than endogenous mCherry fluorescence when visualizing hM4D(Gi)-mCherry in fixed tissue. 1. Aschauer DF, Kreuz S, Rumpel S. Analysis of transduction efficiency, tropism and axonal transport of AAV serotypes 1, 2, 5, 6, 8 and 9 in the mouse brain. PLoS One. 2013 Sep 27;8(9):e76310. PubMed PMID: 24086725. PubMed Central PMCID: PMC3785459. 2. Krashes MJ, Koda S, Ye C, Rogan SC, Adams AC, Cusher DS, Maratos-Flier E, Roth BL, Lowell BB. Rapid, reversible activation of AgRP neurons drives feeding behavior in mice. J Clin Invest. 2011 Apr;121(4):1424-8. PubMed PMID: 21364278. PubMed Central PMCID: PMC3069789. 3. Kügler S, Kilic E, Bähr M. Human synapsin 1 gene promoter confers highly neuron-specific long-term transgene expression from an adenoviral vector in the adult rat brain depending on the transduced area. Gene Ther. 2003 Feb;10(4):337-47. PubMed PMID: 12595892. 4. Sanjana NE, Shalem O, Zhang F. Improved vectors and genome-wide libraries for CRISPR screening. Nat Methods. 2014 Aug;11(8):783-4. PubMed PMID: 25075903. PubMed Central PMCID: PMC4486245.